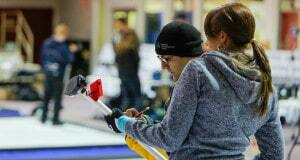 An afternoon sweep of mixed doubles results Friday catapulted Team World well in front of the pack at the World Financial Group Continental Cup curling competition at the Langley Events Centre. 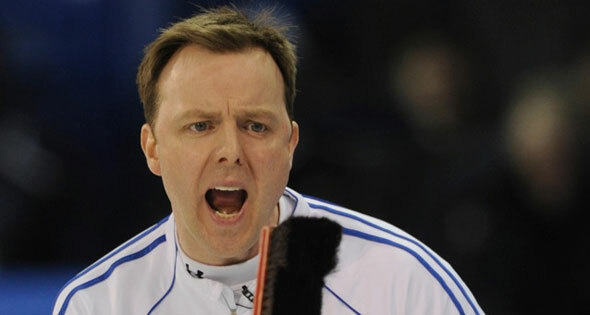 When Scotland’s Tm Brewster executed a highlight-reel quad with his last rock of the second end which gave his team three-point control against Canada’s Jeff Stoughton and, in the end, a 7-6 men’s team win on the night shift, Team World’s 24-point lead (66-42) was solidified heading into today’s matches — two rounds of skins games with a round of singles sandwiched in between. The men’s results were sawed off. Glenn Howard of Canada wiped out a 4-1 deficit after five ends, cracked four in the sixth and a seventh-end heist for a 6-4 win over Sweden’s Niklas Edin while Norway’s Thomas Ulsrud needed a straight last-rock hit for a deuce to forge a 4-4 tie with Pete Fenson’s troops of the U.S.
“Yeah, I wanted to win,” said Brewster, who lost to Stoughton in last year’s World final at Regina. Then there was the quad. The biggest shot played this week at Langley. “They weren’t lying as many against us as it looked, but we certainly had to move a few and we knew the shooter was probably going to run. “The feeling was great. That’s what you curl for. Playing in these events and making a shot like that. You have to be happy. Howard waved off the Team World lead on account of the big points action slated for today and Sunday. He was asked if excess play in skins would prove to be an advantage for North Americans? 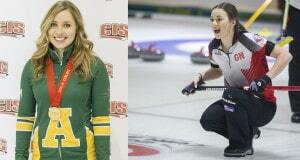 In that one, Sunday at 5 p.m., Stoughton’s Winnipeggers have been chosen to go against double Euro champion Ulsrud. “I don’t know why we’re playing that game but I guess it’s an honour, you know?” said the Norwegian skip. Ulsrud trailed Fenson from the first end when the Amerks cracked an opening deuce. “We were struggling,” Ulsrud admitted. “We were trailing the whole game so to manage a deuce and tie it up was great. “Before I threw my first rock of that last end we asked the coach, do you want to go for the kill and try to get one more behind the corner guard but he said, ‘no guys, just tie it up, that’ll be just fine”. We could have gone for the three but then we could have blown the tie, too. Howard moaned about his team’s “awful start” but the Swedes allowed the Ontario team to wiggle off the hook. “I played one awful shot in the third end when we gave up the three after blanking a couple,” said Howard. “I had a makeable double and I actually wobbled a bit, set it out and flashed and he gets three, and I thought, ‘oh man, I’ve blown it’. The afternoon double sweep afforded the team that was totally embarrassed at last year’s Cup a certain comfort. 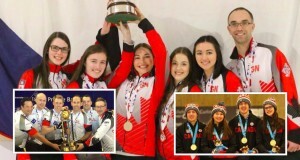 * Greg Drummond and Anna Sloan of Scotland got off to a 5-1 lead and hung on for a 7-5 conquest of the Amerk unit of Joe Polo of the U.S. and Amber Holland of Canada. In women’s competition in the morning, Patti Lank of the U.S. upended two-time Olympic gold medallist Anette Norberg of Sweden 8-5 while Stefanie Lawton of Canada executed a last-rock double to score a point and gain a 3-3 draw with Scotland’s Eve Muirhead, the current Euro champion. China’s Bingyu Wang, meanwhile, eliminated a partially hidden stone with her last to score two points and defeat Amber Holland of Canada 6-4.